TEXTS FROM MY TEEN: MOM! YOU NEED TO TREAT ME LIKE AND ADUL - ProudMummy.com the Web's Community for Mums. 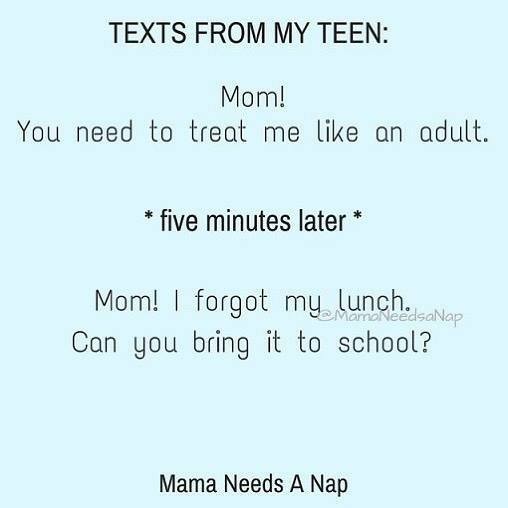 TEXTS FROM MY TEEN: MOM! YOU NEED TO TREAT ME LIKE AND ADULT. *FIVE MINUTES LATER* MOM! I FORGOT MY LUNCH. CAN YOU BRING IT TO SCHOOL? My 16yr old to a T! Lauren Olwell this is u! Kirsten Hannah Rodgers... so so true! Jadey Fmf Paramore this is deffo you! Lee Doherty Ellie Doherty true !! !